So maybe I do sort of cheat when I don't put up the week's menu plan til after dinner Monday. You'll get over it. Tuesday: It's a Dine to Donate day for Blessings in a Backpack at one of our favorite local restaurants. Since Jack's restaurant behavior has been a little iffy lately, maybe we'll just get carry-out. Love G's pizza! Wednesday: Probably something simple - Shells and Cheese with Kielbasa? And maybe some peas. Thursday: Mimi and Papa are staying for dinner after they watch Jack for part of the day. Maggie says they'd like spaghetti. The jury's still out, but that's the best suggestion I have so far. Want much better ideas than mine? 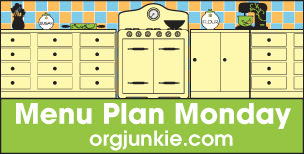 Check out Menu Plan Monday over at I'm an Organizing Junkie.